"When our oldest daughter was a toddler we discovered she had spinal scoliosis. I have chronic back pain and had been treated successfully by Dr. Harris for a few years. His adjustments relieved my neck and back pain and seems to have improved my overall health. Having an adjustment is like having your body feel 'unlocked'. Our daughter began having regular adjustments by Dr. Harris. She has a significant curve and I was told by her orthopedist that she would need a back brace eventually. We continued with her regular adjustments about once a month. We returned to our daughter's orthopedist for a follow up and were so excited to receive the happy news that she did not need a brace! Her neck, back and pelvic curve had improved. Thanks to Dr. Harris's expert adjustments her scoliosis has been arrested. Many thanks, Dr. Harris, for your excellent chiropractic care." "Harvey Lillard...could not hear the racket of a wagon on the street or the ticking of a watch. I made an inquiry as to the cause of his deafness and was informed that when he was exerting himself in a cramped, stooping position, he felt something give way in his back and immediately became deaf." "An examination showed a vertebra racked from its normal position. I reasoned that if that vertebra was replaced, the man's hearing should be restored. With this object in view, a half hour's talk persuaded Mr. Lillard to allow me to replace it. I racked it into position by using the spinous process as a lever, and soon the man could hear as before." ...The idea that knows the cause, that can correct the cause of dis-ease, is one of the biggest ideas known..."
What is the Gonstead Chiropractic Method? 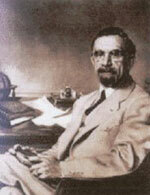 Dr. Clarence S. Gonstead practiced chiropractic from 1923 until 1978. He decided to become a chiropractor after chiropractic adjustments allowed his body to heal from a painful, crippling episode of rheumatoid arthritis. Using his background in mechanical engineering and extensive hours spent studying cadaver spines, he developed a unique approach to applying chiropractic care. His application brought him both national and international acclaim, and he was known as a "chiropractor's chiropractor". His practice was located in Mt. Horeb, Wisconsin (pop. 4000), drew patients from all over the world, and is still the largest to have existed to date. Dr. Gonstead's brilliant mind and lifelong experience of treating over one million patients enabled him to develop and refine his technique which is now taught and practiced by doctors of chiropractic all over the world. Primitive forms of chiropractic were used as early as 17,500 B.C. Hippocrates, the Father of Medicine, talked of spinal misalignment problems, and Germany has had "bonesetters" for years. Chiropractic, as we know it, started about 100 years ago. The first recorded chiropractic adjustment was performed on September 18,1895, by Dr. Daniel David Palmer, a Canadian-born teacher and healer. D.D. Palmer was born in 1845 on the Ontario frontier. At age 11, a business failure forced his family to move to the U.S. He and his younger brother stayed behind and worked in a factory until 1865. Then they rejoined their family. By the 1880s, Palmer's thirst for knowledge led him to learn magnetic healing. This therapy used the body's magnetism to heal others. Palmer opened his first magnetic healing practice in Burlington, Iowa. A year later, in 1887, Palmer moved to Davenport, Iowa, where he started another practice. Dr. Palmer was studying the cause and effect of disease. In Palmer's building, was a janitorial service, owned by Harvey Lillard, who had been deaf for 17 years. Palmer asked how he had become deaf. Lillard replied that one day, when he had strained his back, he heard something "pop" in his back. For over17 years Mr. Lillard complained of hearing problems. Palmer examined Lillard's back and found a spinal vertebrae out of position. Reasoning this to be the cause of Lillard's deafness, Palmer pushed the vertebrae back into place. As he expected, Lillard's hearing improved. Palmer theorized that decreased nerve flow may be the cause of disease, and that misplaced spinal vertebrae may cause pressure on the nerves. He reasoned, if the spinal column were correctly positioned, the body would be healthy. This dramatic beginning caused a great deal of excitement, and soon exaggerated claims surfaced from activists and zealots. At first Dr. Palmer thought that he had discovered a cure for deafness. Because chiropractic challenged the traditional medical concept of health, a campaign was begun to discredit and eliminate the profession. This campaign is less active today. One of Dr. Palmer's patients, a minister, took the Greek words for "hand" (cheiros) and "done by" (pracktos) and put them together to spell chiropractic, meaning "done by the hand." Palmer decided to open a chiropractic school in 1897. By 1902, 15 people had graduated from the Palmer Infirmary and Chiropractic Institute, which was renamed the Palmer School of Chiropractic (PSC) in 1907. One of these graduates was Palmer's son, Bartlett Joshua (B.J.) 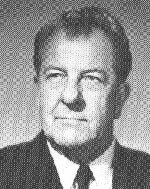 Palmer, DC, who would become as memorable a figure in chiropractic history as his father. Daniel David Palmer began some travels to the West Coast, and little by little, his son, Bartlett, took over running the daily activities of the school. Chiropractors, just as early medical doctors, were not licensed by the government. Chiropractors simply opened a practice after graduating from chiropractic school. By that time, however, medical doctors were required to have licenses. This discrepancy caused continual problems for chiropractors throughout the first half of the 20th century. In 1906, When Daniel Palmer returned to Davenport, he and hundreds of other chiropractors were convicted of practicing medicine without a license. He was released after serving 23 days of a 105-day sentence, and paying a $350 fine. A year later, one of Palmer's former students, Shegataro Morikubo, DC, was arrested in Wisconsin for practicing medicine, surgery and osteopathy without a license. In a landmark decision, the judge and jury agreed that Morikubo was not practicing medicine, surgery and osteopathy. Rather, he was practicing something different - chiropractic. In 1910, B.J. Palmer introduced the use of X-rays. In 1924, he introduced the neurocalometer to reveal more scientifically the location of out-of-position spinal bones. Through the end of World War II, chiropractic became controversial under B.J. Palmer, the son of the profession's founder. He administrated the largest chiropractic college at that time, owned radio and TV stations, traveled extensively, and even hosted three U.S. Presidents - Coolidge, Hoover and Truman - at his home. In 1924, B.J. had the first radio station west of the Mississippi , WOC (or, Wonders Of Chiropractic). In 1928 he purchased WHO (With Hands Only) in Des Moines. However history will judge B.J. Palmer, it can be certain that without B.J. Palmer, chiropractic would not have survived the early ruthless attempts to discredit its healing ability. Starting in 1944, World War II veterans could get government benefits. Using the G.I. Bill , returning soldiers enrolled in chiropractic colleges by the thousands. Chiropractic is now second only to medicine as the largest primary health care provider in the western world. Palmer College of Chiropractic in Davenport, Iowa, grew from 24 students in 1906 to 3,100 in 1923. Today, there are more than 23 chiropractic institutions throughout the world Current enrollment at chiropractic institutions now exceeds 10,000 dedicated students. Since Dr. Palmer's first primitive chiropractic adjustment, the art and science of chiropractic has progressed significantly. Acceptance among other health care professionals has resulted from advanced diagnostic procedures, scientific research, and sophisticated equipment.